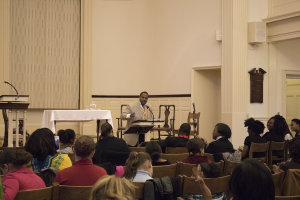 The Center for Religious & Spiritual Life embarked on the beginning of a sacred relationship with the Alden Baptist Church on Sunday. 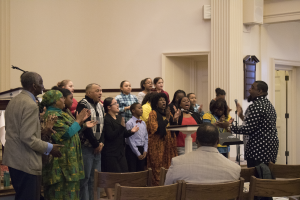 The Helen Hills Hills Chapel hosted the Alden Baptist Church in a special ceremony celebrating the intersections of religion and race for Black History Month. 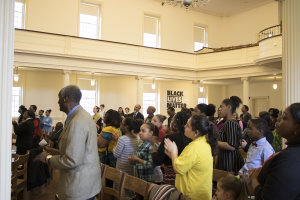 CRSL Director Matilda Rose Cantwell and Worship Leader Reverend Dr. Jacquelyn Smith-Crooks stood beside each other, living symbols of the emerging partnership, as they welcomed congregation members and newcomers to the Chapel. 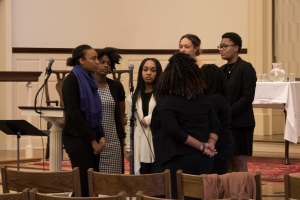 Matilda thanked attendees for joining, specifically addressing the students who placed academic to-dos on the back burner to attend the service. A murmur of agreement rippled across the pews when she asked, “Have you ever noticed when you make time for God, you have more time for everything else?” However God appears to you, making time for that figure strengthens us in all realms. Especially as midterms approach, we must remind our academic self to make room for our spiritual self! In the traditional call to worship style of lead-and-respond, Worship Leader Rev. Dr. Jacquelyn Smith-Crooks and Rev. Dr. L.A. Love responded to Adriana’s message of togetherness. Both Reverends braided messages of welcome into the service. “We fellowship together as a family,” Rev. Dr. Love shared, encouraging all attendees to join the Alden Baptist Church for regular Sunday worship. “The members of the congregation will let you know you are welcome. Our beloved Pastor’s wife will give you a hug you can’t forget!” added Rev. Dr. Smith-Crooks. The congregation took a rest from musical worship for Rev. Dr. Love’s sermon. In the spirit of Black History Month, he opened the sermon with a powerful, emotional question: “what do you do when your skin becomes your sin?” The response was visceral. Some waved and nodded in agreement, others exclaimed in passionate attestation. Rev. Dr. Love went on, citing Mark 1:40-45: the passages tell of Jesus meeting and curing a man with leprosy. Rev. Dr. Love equated the ostracizing of lepers on the basis of skin condition to the reality of race in today’s world. Rev. Dr. Love drew a parallel between the colonies and the projects. The leper came to Jesus in the city, despite confinement to the colony. “If I stay where they tell me to stay, how can I come to Jesus?…Don’t let your condition control your courageousness”, declared Rev. Dr. Love. It is through tears, touch and testimony that we celebrate God. Tears can be of joy, of release, of refreshment. Tears can come from the frustrations of disenfranchisement. In the words of Rev. Dr. Love, touch is the compassion of Christ. He will walk with you through your struggles and hold you when you’re weak. And when you have shed your tears, and felt His touch, you will be given testimony. He will tell you what you need, and will deliver when the time is right. This entry was posted in Programs & Events, Student Reflections and tagged campus news, CRSL news, identity, race/racism, worship. Bookmark the permalink.